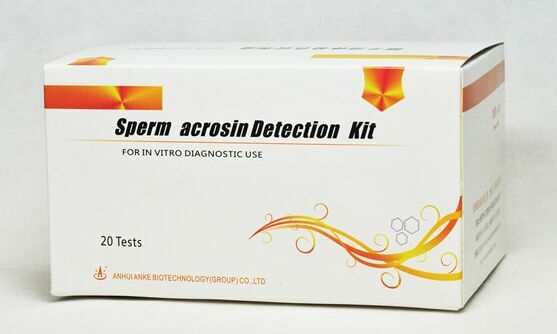 PSA-FITC staining was used for the shape of sperm acrosin to evaluate acrosin function. The kit can be used for the evaluation of male fertility. Stored at -20℃ for 10 months. (7) Observed sperm smear under microscope (400×) at 450-490nm. Acrosin Integrity (AI): fluorescent staining in more than half of sperm head is brighter and uniform; acrosin reaction (AR): fluorescence strap appears in equatorial zone or without fluorescein stain in acrosin zone; acrosin abnormality: all sperm except for the above two kinds of sperm. [The registration Number of Medical Devices] GSYJX (Z) Z2011N1400171.